Green Bag Lady: Amy Butler! 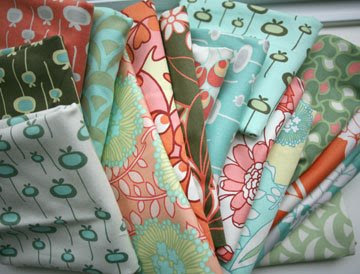 Those of you who love fabric know and love Amy Butler for her gorgeous designs and patterns. Do you need another reason to admire her? How about generosity? Look at what she sent for us to make bags out of. . . 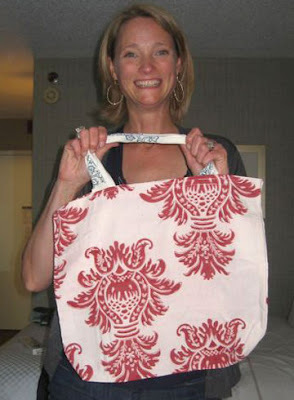 So, the reason that we were lucky enough to get fabric from the Amy Butler warehouse is that Harmony is friends with her, told her about the project and even gave her a bag for me. This is Amy with the bag she picked out. This is Diane, Amy's assistant, and her Green Bag Lady bags that she picked out for herself and her daughter. And, finally, this is Mallory, who I do believe was the one kind enough to pack and ship the box of loveliness! Thank you to everyone at Amy Butler. We truly appreciate your generosity and will be happy to take fabric off your hands anytime! You are one lucky Green Bag Lady ! Those are so darn cute! I'd love a bag from those! I found your site yesterday morning. 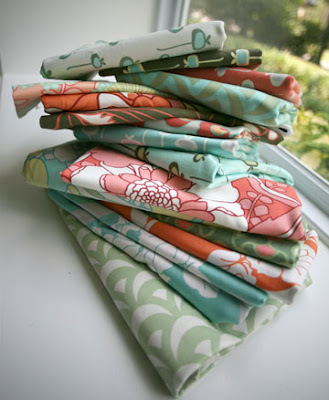 It inspired me to get out my HUGE fabric stash and yesterday alone I churned out a dozen "Green Bag Lady" bags. I'm hosting a giveaway on my own blog today! I did link to your blog, hope that's okay!